Horgen, Switzerland — March 17, 2015 — Trinseo (NYSE: TSE), the global materials company and manufacturer of plastic, latex and rubber, is set to participate in the 2015 International VDI Conference “Plastics in Automotive Engineering.” The VDI Conference serves as an excellent opportunity for Trinseo Automotive, previously known as Styron, to showcase its top-notch engineering capabilities and commercial successes with key global automotive players throughout the industry. > ENLITE™ LGF-PP provides a lightweight alternative to help customers meet market regulations regarding vehicle weight. With a 60% glass concentrate system, which is diluted with neat polypropylene, customers have the flexibility to achieve the direct proportion of glass they need. 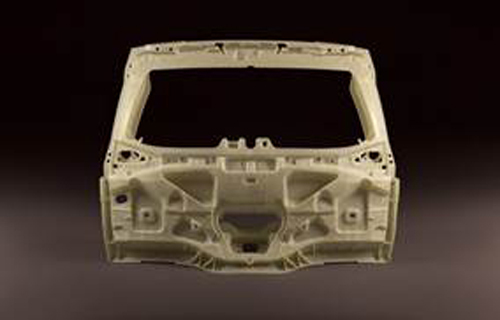 > One example featured at VDI is the development of the lift-gate and front-end module of the new Renault Espace, which was designed with LGF-PP polymers from Trinseo. This innovation is part of a long-term collaboration between Renault and Trinseo Automotive, which began with a real serial life solution in the Renault Clio. >Like ENLITE™ LGF-PP, ENLITE™ GF-Alloys offer lightweight optimization and customer flexibility. This product provides a bridge between the glass-filled polypropylene solutions of today and the enhanced carbon fiber solutions of the future. ENLITE™ GF-Alloys tackle specific areas in which process constraints are difficult to overcome. For example, when the design of the part necessitates thick walls to meet stiffness requirements, or the elimination of steel reinforcements, GF-Alloys provide an optimal solution. The first product designed in the GF-Alloys range is the GF-ABS alloy, which is a glass concentrate diluted with ABS.